I have finally reached home. My apologies for not having given you a feedback yet. I have nothing but accolades and praises for all that you have done for our group. Thank you again for service and hospitality par excellence! You guys are amazing!! On arrival at Cochin Airport early morning, you will be received & transferred to your hotel in Fort Cochin for check in. Rest of the day at leisure. Overnight at hotel. Cochin the queen of the Arabian Sea is one of the most interesting cities of India and has one of the finest natural harbours in the world. 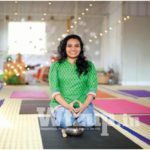 A root-conscious people of Kerala have preserved their past not only in the form of history books but also in the form of monuments and palaces. Places, palaces and institutions of historic value are being preserved conscientiously. Morning, after a leisurely breakfast, you will be guided to Pepper Trails Kitchen where the host family will receive you with a special homemade welcome drink. Later you will start your cooking day by preparing 3-4 Kerala dishes followed by lunch with the family. We will also have a caricaturist at Pepper Trails who will draw the caricature images one by one to take home as a memory of your great travel in Kerala. Evening visit a traditional Kathakali Centre to watch a Kathakali Dance Show Dinner & overnight at Hotel. Kerala has a distinctive cuisine, very unusual and different from the rest of India. Cooking in Kerala is all about discoveries, aromas and colours. Kerala cuisine is very hot and spicy and offers several gastronomic opportunities to those willing to experiment with the local cuisine. Traditionally, in Kerala food is served on a banana leaf. One has to take food with right hand. Tender coconut water is a refreshing nutritious thirst quencher..Seafood’s are main diet of Coastal Kerala. Here at Pepper Trails, we are trying to pass on a tradition of our kitchen to the World. 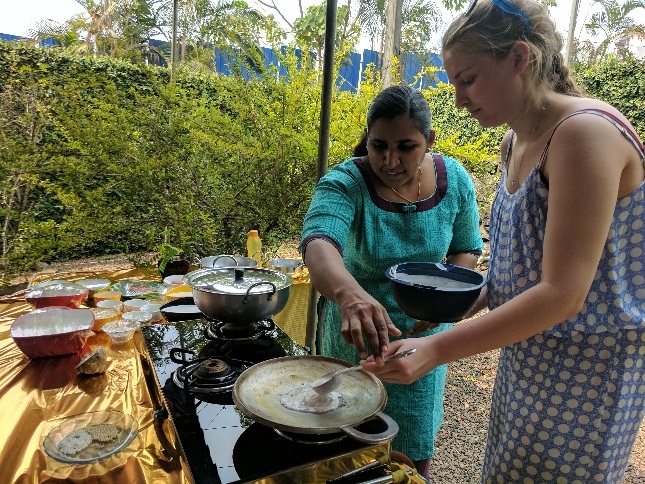 The cookery demo will be conducted at short distance away from Kochi, in the beautiful ambiance of a Kerala’s modern architectural bungalow, nestled on the top of a valley in its natural setting with a peaceful ambience combined with refreshing environment, promising to make your another day in Kerala a wonderful experience. Enjoy a warm welcome by the breath taking lush green landscape complimented by a welcome drink and… now you are a part of our home…This cookery demo is not just being in the kitchen, will give you hands on experience, you’ll learn to prepare 3-4 variety of Kerala’s delicacies in a friendly, relaxed, informal environment. Each dish will be demonstrated, prepared and cooked. You will then be able to enjoy tasting each dish and take home the recipes as a memento of your delicious day. 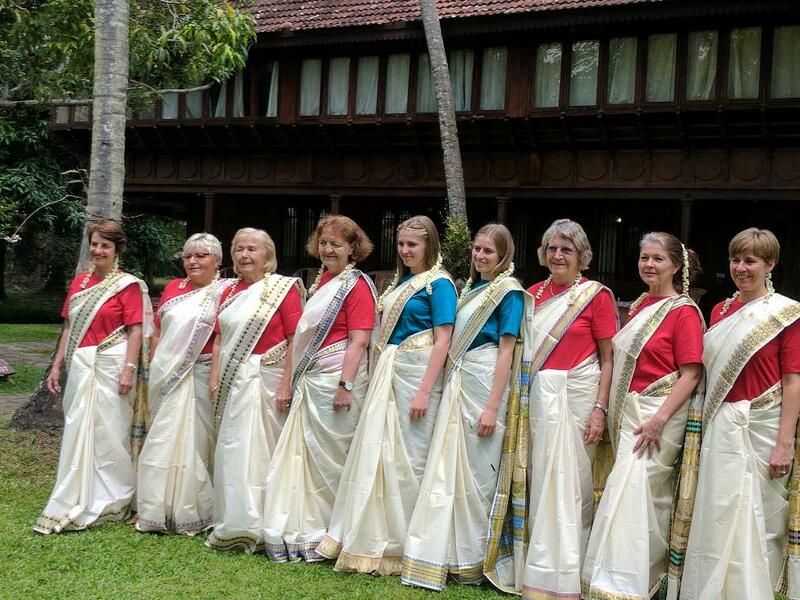 After breakfast,go for a short guided tour of Cochin.Early evening visit a traditional Kalari Centre to watch a martial arts performance.. Dinner & overnight at hotel. head quarters due to the proximity of Cochin Port. While Fort Cochin became the administrative head quarters, Mattancherry maintained its trading status. The colonial stature and buildings still make Fort Cochin a favourite destination for tourists. Its getting an upgrade once its declared as the first heritage city in India.Fort Cochin was also a part of Muzirisroute. 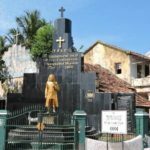 It will be interesting to know that around 13 religious communities are harmoniously living in Fort Cochin and Mattancherry. Christians, Muslims, Hindus, Jews, Jains, Sikhs etc are few among them. Morning, after breakfast, proceed to Munnar, known as nature lover’s paradise. Enroute you will halt at Eastend Farmyard for lunch followed by a spice garden visit. On arrival check in at your resort. Dinner& Overnight at the Resort. Full day guided Tea Trail experience. You will be driven to a Tea Plantation to go with the workers to pluck the tea leaves and you will go through the whole process of making tea.In between our Naturalist will give you short Nature walks through the tea plantation.Lunch will be served at the Estate Bungalow.Finally you will taste your own tea and will take home half kilo of Tea as memory of your day experience.Dinner&Overnight at the Resort. Munnar –perched on the roof of Western Ghats is explored by John Monroe in 1877 during a land survey of Travancore High range for British India. Later two Scottish men Henry & William Turner pioneered plantations in Munnar under a concession from the then King of High Range. They constituted ‘North Travancore Land Planting & Agricultural Society’ in 1879. There begins the age of Plantations in South Western Ghats. The first plantations were Cinchona, Coffee, Cardamom and Sessile . Later Baron Ato Von Rosenberg, a German planter joined them and constituted United Planters Association of South India (UPASI). In 1895 Finley Company reorganized all plantations and constituted all under their management agent ‘The Kannan Devan Hills Producers Company’. In 1973 , after FERA(Foreign Exchange Regulation Act) came into existence, the Finley company lost its holdings and a new company constituted under their then management company Tata Tea. Thus Tata Finely born. In 1983 Tata took over the complete plantations from the Finely and now its Tata Tea. A Study tour through the rolling hills of tea garden experiencing Tea from plant to packet. A full day exploration by walk, interaction and participation with planters, and workers . The day start with early morning ride from your hotel to a private tea plantation . 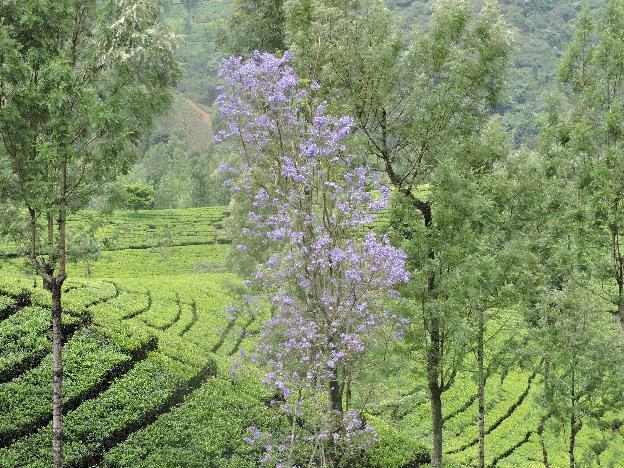 The plantation is more than hundred years old and located in the foothill of Aanamudi-the highest peak in South India. The geographic feature of the area offers excellent scenic wonders including sighting of wildlife. 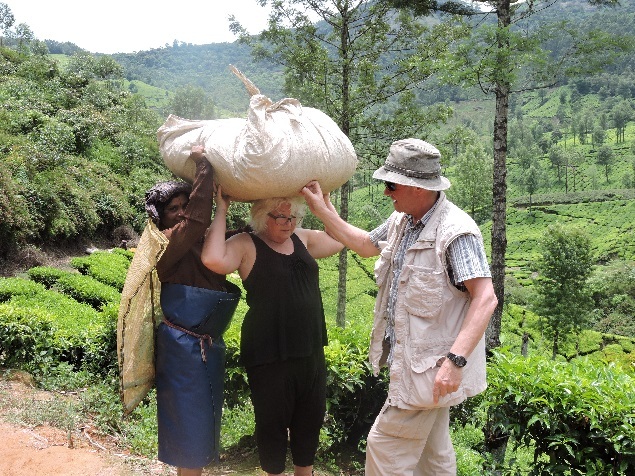 The tour start with a walk through the garden with tea pickers. Our guide – a tea expert – will explain the method and norms of picking . You can join them and start picking tea leaves. Your collection will be taken to a mini factory separately. Mean time you can interact with the workers and supervisor. After a tea break you will be invited to visit their factory. There you can experience all levels of processing and production. Then it is the time for you to make your own tea with the leaves you collected in the morning. You can do all processes in the mini factory with the help of workers. Your lunch will be arranged in the Colonial Bungalow once used by British Planters. After the lunch a guided walk through the garden in the forest fringe to watch nature, wildlife and birds. Return to the factory by the time of ‘Tea Tasting’. Mean time your own tea, which is picked and processed by you will be ready for packing. After a tea and snack return to your hotel. After a leisurely breakfast, drive to a backwater destination. You will have a stop at Kothamanagalam for lunch as optional. Dinner and overnight at the Resort at Vayalar. Enjoy your breakfast at the hotel. We will take the Birthday Boy to a village temple for blessings. Later drive to Alleppey to board your exclusive Houseboat for a cruise through the backwater villages followed by overnight stay on board. Your meals are freshly cooked and served on board. Explore the amazing backwater life of Kerala! Overnight on the Houseboat. What is truly magical about a houseboat is the breathtaking view of the untouched and otherwise inaccessible rural Kerala that it offers. The houseboats have all the creature comforts of a good hotel including furnished bedrooms, modern toilets, cozy living rooms, a kitchen where are cooked on board and supplemented with fresh fish from the backwaters. Today, the tradition is still continued and the food from the local cuisine is served by the Kuttanad locals, on board. The name Backwaters brings you the very thought of Houseboats. Food and leisurely times spent on-board with the feeling and privacy of house as well as enjoying the natural beauty. A Cruise amidst marvellous mangrove forests, captivating coconut canopies, swaying palms, mangrove forests, pulsating paddy fields sprinkled with enchanting waterways and canals decked with white lilies, can be quite a rejuvenating experience for the weary traveller. 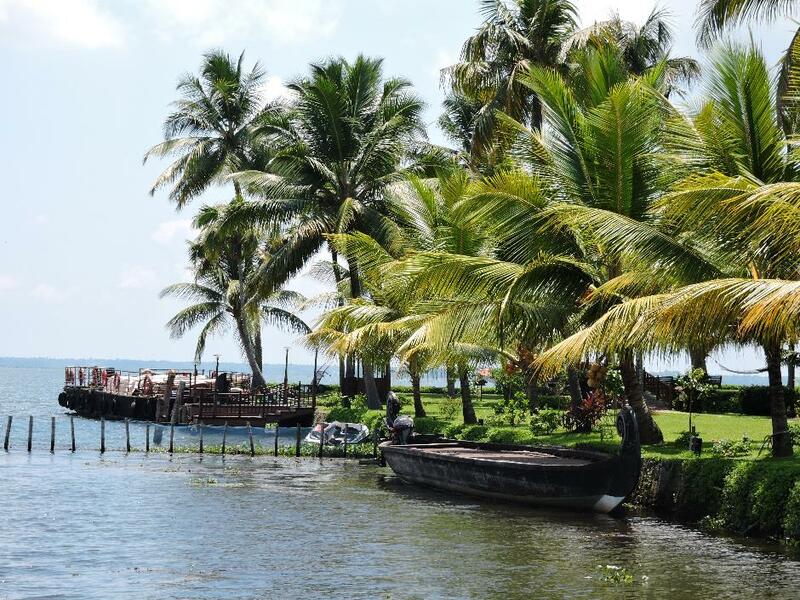 Enjoying a cruise in these backwaters is not to be missed, as it leaves you feeling fully rejuvenated. The banks of these backwaters in Kerala are the most enchanting picnic spots. You get to experience the native way of living. The experience on the Houseboat is not the one to be explained by words. Its to be lived and evolved by yourself. sprinkled with traditional houseboats, country crafts, rural lifestyles and Tranquility. Enjoy the place during rest of the day. 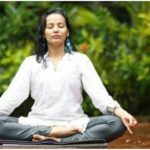 You have one Ayurveda Massage included which you may avail during one of your days at this place. Lunch, Dinner & Overnight at the Resort. Full day to explore the backwaters. 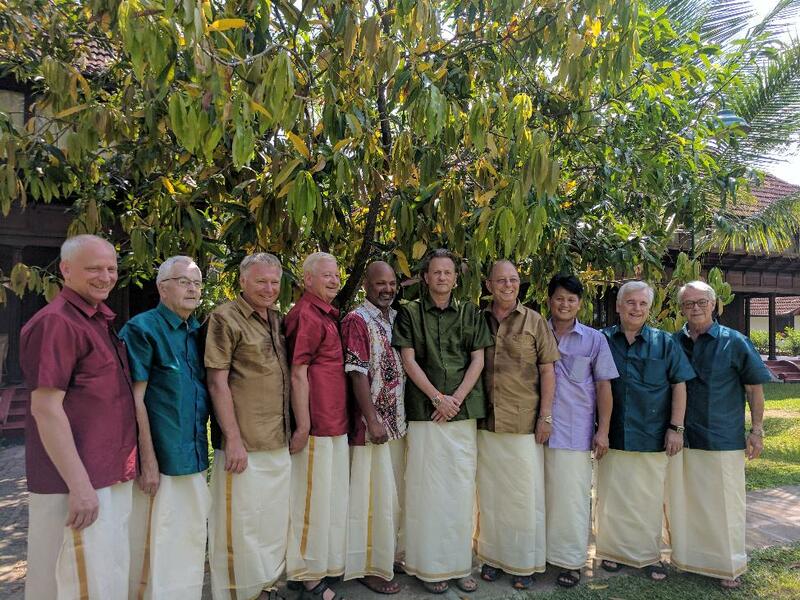 Morning after breakfast, you will all dress up in Kerala style to visit a local temple for a special prayer for the Birthday Boy. We may have a photo session in the traditional attire, if you wish. Today you will have a special traditional vegetarian birthday meal served on banana leaf with special payasam as the desert. You will also have a cooking demonstration on making payasam which is a traditional desert of Kerala. Rest of the day at leisure at the resort. You will have a Cake cutting in one of your rooms. Later exclusive dinner accompanied by a cultural program. Dinner & overnight at Resort. picturesque, clean village like most places in Kerala. The Kumarakom Bird Sanctuary is spread across 14 acres, the bird sanctuary is a favourite haunt of migratory birds and an ornithologist’s paradise. Egrets, darters, herons, teal, waterfowl, cuckoo, wild duck and migratory birds like the Siberian stork that live in flocks are a fascination for visitors. 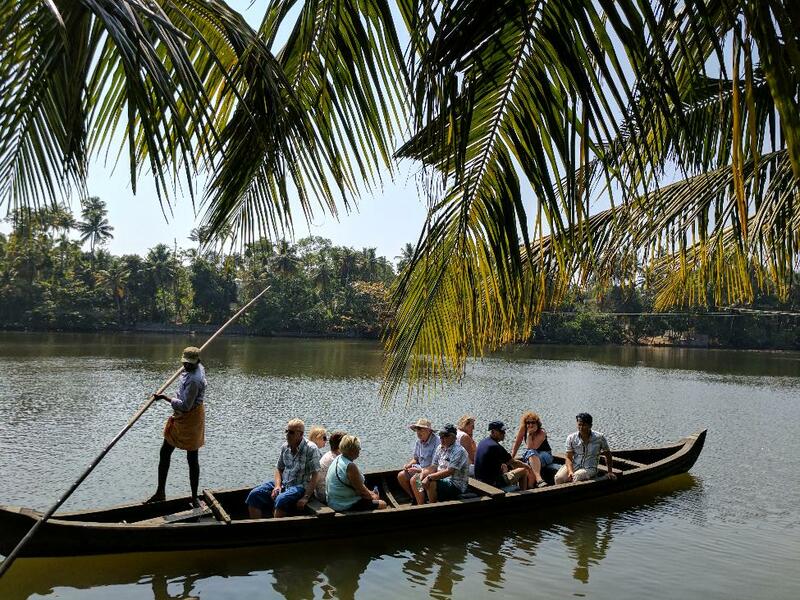 The best way to watch the birds of the Kumarakom sanctuary is a boat trip round the islands. Full day to explore the backwaters. You may opt to visit Bird sanctuary in the early morning by boat. Later you may opt to go for a village walk guided from the resort. Lunch, Dinner & overnight the resort. After a leisurely breakfast, check out and drive to Cochin. En route go for a guided village backwater cruise at Poothotta island backwater village. You will be cruising in a canoe boat through the narrow zigzag canals to touch the nature. You will also witness village activities like coir making etc. Lunch at a local farm house with fresh catch of the day. You may also visit Vaikom Temple, if you wish. Afternoon drive to Cochin. On arrival at Cochin, check in at your hotel. Dinner & Overnight at Hotel. Village backwater Cruise – A journey in a country boat into the pristine purity of a typical village backwater of Kerala…. 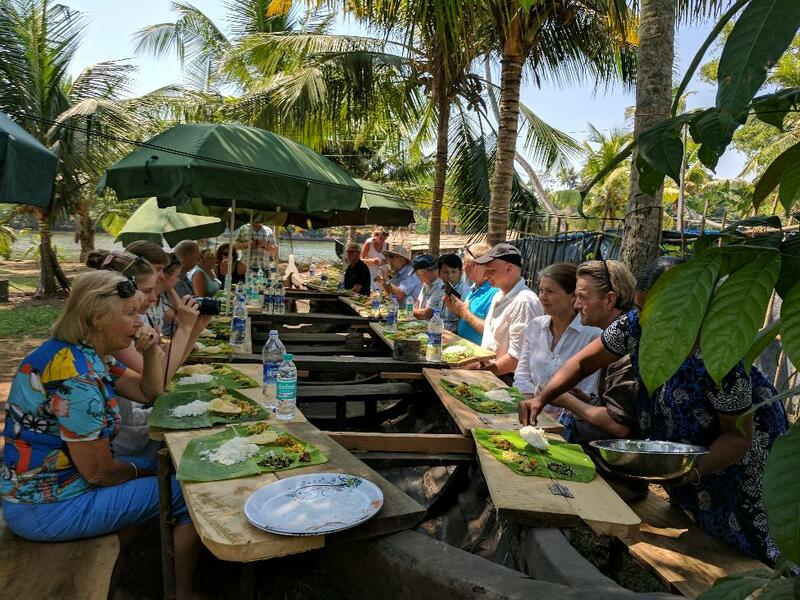 goes through the zigzagging narrow canals and paddy fields fringed with coconut palms…..watch rare birds….country boat making….a natural fish farm where you can go fishing…. You will witness coir making, toddy tapping before you end up your exclusive experience in our Farm House for lunch -a delicious traditional Kerala dish under a tree…..While scrolling through this amazing village, you will watch the common life of the villagers for their livelihood. You will see them fishing in the river, the women do the coir making, a toddy tapper who does his job as a routine, men climbing the coconut trees to pluck the coconuts, later peeling the same to prepare to dry and make oil extraction possible. 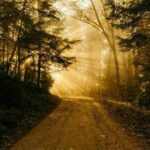 Its all about a life experience which you will cherish throughout your life. Full day at leisure. You may opt to visit Lulu Mall till noon. Also may visit MG Road, Broadway& Marine Drive for a life feel of Cochin City. Fare well Dinner at your hotel. Today you will be assisted and transferred to Cochin Airport to connect your flight home.